I had mixed feelings about Birdsong when I first read it last year. I have always enjoyed reading Sebastian Faulks but I often find his melodramatic storylines put me off. So when I heard that there was a new two part drama out on the BBC, I wasn’t sure what to expect. I found the love affair between Stephen Wraysford and Isabelle Azaire to be over the top and unrealistic in the book, but maybe this storyline would be interpreted better as a filmed drama? And could the BBC pull off the horrors of the First World War scenes in the same harrowing and detailed way that Faulks did? I was eager to find out. In the end, it took me a few days to finally settle down to watch Birdsong, mostly because I wanted to be in the right frame of mind to sit through an hour or two of depressing war scenes. It wasn’t actually the war scenes that I should have worried about – it was everything else. I was pre-warned that there was a lot of ‘staring into space’, but this did not fully prepare me for the huge amount of blank faces… sorry, I mean ‘meaningful looks’. I also wasn’t prepared for the loud and dramatic music that was constantly building up and up and up to… another scene of the two lovers staring into each other’s eyes. This adaptation would have been a lot more bearable if Wraysford had been played by someone who didn’t constantly have the same expression on his face. Eddie Redmayne seems to have quite a following, but I really don’t understand why. As a young, innocent Wraysford falling in love, he isn’t too bad, but as a commanding officer in the war, he is utterly unbelievable. The beautiful Clémence Poésy was a good choice for Isabelle, the young wife of Mr. Azaire. She is a good actor and played the scenes well but this could not stop the lack of chemistry between her and Radmayne. There are some slight plot changes, which worked well for an adaptation. The modern character of Elizabeth is left out completely and Isabelle’s sister plays a larger role, being introduced earlier in the storyline. One of my favourite characters from the book, Michael Weir, has a smaller role in the BBC adaptation. I can understand that timing was an issue, but it was a shame that we did not have a chance to get to know his character and explore the odd friendship that developed between him and Wraysford. 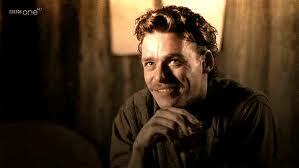 I also wouldn’t have minded watching more of Richard Madden who acted the part very well. 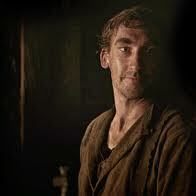 The best character portrayal in this adaptation has to be Joseph Mawle as Jack Firebrace. He is the only person in the whole of the drama that I actually cared about. In the book, I remember warming slowly to all the characters, but Firebrace was always the most obviously likeable. With his wise words and worries for his young son, he wins Wraysford over and although there is also a lot of staring into space involved with his storylines, I found him less irritating. Overall, this adaptation was disappointing because of the weak script and over the top music. The choice of leading actor also let down the rest of the cast, who were otherwise excellent. It may have looked good, but even the war scenes did not mean much compared to the disturbing effect that the book had on me. Hopefully one day we will see a much more worthwhile adaptation. I would love to know what everyone else thinks. Am I being harsh, or do you agree that this was a wasted opportunity? If you would like your own copy of the DVD, click the picture below. There do seem to be some mixed thoughts on this adaption. I didn’t enjoy it but I’m happy if it is making people read the book! I totally disagree! Here’s a link to my post on the adaptation. Feel free to disagree with me too! Sounds like that Aaronovitch guy got on your nerves a bit! Thanks for the link! I’ve had this taped for ages but haven’t gotten round to watching it for the same reasons that made you tentative. I think I’ll just delete it now – it doesn’t sound great at all. Shame to see that happen to such a fab book! I know, it is a shame! The trailer looked so promising too! I haven’t heard of the book or movie. Sounds like I should skip the BBC production. Thanks for the review. I haven’t heard of anyone enjoying it yet. But the book is definitely worth a go!